I just purchased this guitar from the owner in California. It has not yet arrived here in NJ. I communicated with the owner who says he is a Schireson relative. It is his photograph. There is not much info online, and i have seen nothing about a metal body...maybe it is a one off or frankenstein...been a theme in my collection recently. Looks very much like triolian colors. The headstock is actually peaked and veneer overlay with 3 digit serial stamped national style top headstock edge. Dont know what i will find inside when it arrives. If anyone has a hint it will be you folks. Thanks. I look forward to seeing more pics and hearing about it. It is travelling by ground so should arrive mid week. It has a flat back so thinking its likely not a stock National body, though thinking it could have been made on specs from Schireson by Adolph Richenbacher...all these shops were in Los Angeles at the time. 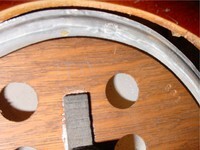 As you could guess it is branded Hollywood which seems to be the name Schireson used on many instruments. 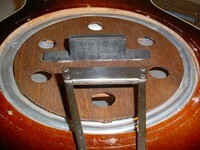 Looks to be a standard Hollywood Schireson construction with (I should imagine) upturned bowl resonator with long stick bridge in the middle. It is, however, metal - certainly the only one I've seen!! Well here are the innards...nothing stamped or written as far as i can see so far...no patent stamp on the cone...body soldered on the inside will try to get a few shots when i get a better setup. dust is all removed now hope is sounds as good when reassembled. 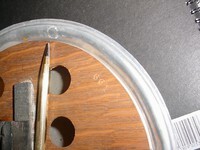 Re the contact point between the spider and cone...looks like felt presently. 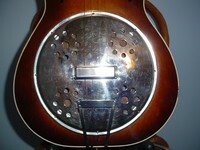 The tone coming durectly out of the coverplate iwas very sweet as is. The neck assembly attached with machine screws and nuts, however since it developed a noticeable deflection at body joint will have to consider it a flawed design. 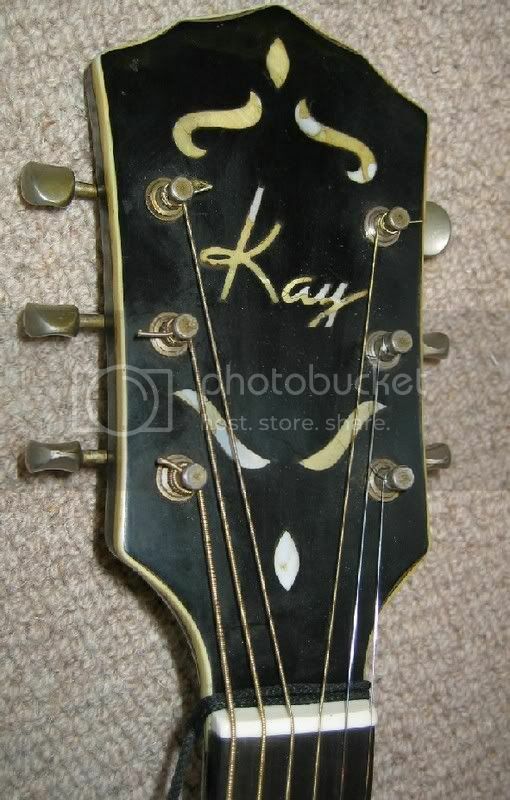 I rebuilt a Kay Deluxe with the original Schireson cone in it. Mine had the tall, massive wood bridge and saddle, not the big disk like this one. I replaced the wood bridge with a cut down cast spider-bridge. Worked pretty well. That thing in your guitar looks massive! 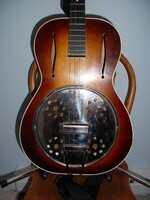 Very cool guitar, though. Got a few more photos of the inside with my iphone...gets into tight spots. 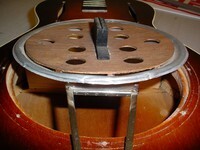 But actually plan to disassemble it again after Christmas and get the neck angle shimmed and improved. It is an inflection at the point of the neck block and fingerboard extension...with some minor neck bow/relief...can move it a bit so should be tweakable. All told, pretty happy with the find that cost roughly the price of a generic asian reso. Along with the National hawaiian electric prototype found by the other geezer on ebay, goes to show there is still some interesting stuff out there. Too bad about the missing 20th fret. That would limit my playing considerably (right!). 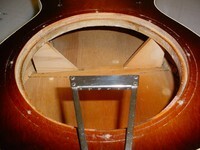 Do you think it was salvaged to replace one closer to the nut?